How do we know? Well, we reached out to Training Industry’s Director of Corporate Research, Tom Whelan, Ph.D., and commissioned a survey of IT learners to find out. While our customers boast about growing their training business and overall revenues due to the ability to remotely train customers, partners, and employees on realistic hands-on cloud-based training environments, we know that some IT companies are still hesitant to move away from (or supplement) their familiar instructor-led, classroom-based, face-to-face methods. Virtual labs give students the ability to train in an environment that mirrors their actual job, without any risk to production systems or data. Virtual training labs can be used for instructor led training – small classes or as part of huge events, for virtual instructor led training live or recorded, self-paced training and certification processes. Features such as chat messaging and “over-the-shoulder barge in capabilities, can make training intimate and interactive. The benefits for software vendors are clear and many – the ability to train remotely, from anywhere, cost-effectively and to scale their training operations, quickly and easily. Yet, companies are concerned about their learners’ experience and their comfort with the technology. Here’s what’s known. Identical elements theory, which is based on classical conditioning research, shows that when both the training task and the on-the-job task are the same, knowledge transfer is much more likely to occur and lead to performance impacts. This is the same logic that applies to flight simulators in the aviation industry and surgical simulators in the medical industry, and look how much these industries rely on them. So, we were curious to understand the missing piece of the puzzle – what do IT learners think of the virtual training labs experience? While research on virtual labs exists, as far as we know, there were no previous studies that asked the learner’s perspective. That’s why we undertook this first of its kind research study using Training Industry as a trusted research partner. Trainees report that virtual training lab environments (VTLEs) help them accomplish things more quickly, increase their productivity, and help them learn better. They enjoy training this way, find it natural, and prefer it. With more experience, their enthusiasm tends to grow. Furthermore, very few say they lack the equipment, knowledge or resources they need to use virtual training labs. 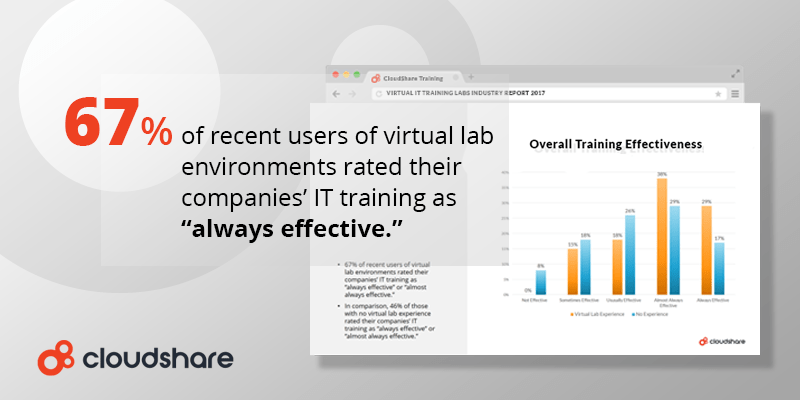 In fact, nearly three-quarters of those with virtual lab experience prefer virtual IT training to traditional methods. While I touched on the highlights of the survey results above, the research covered many additional questions, including what are the most relevant use cases for virtual training labs and the most important features.